After being waylaid in Nantucket for an extra day due to fog and drizzle, we were ready to move on. 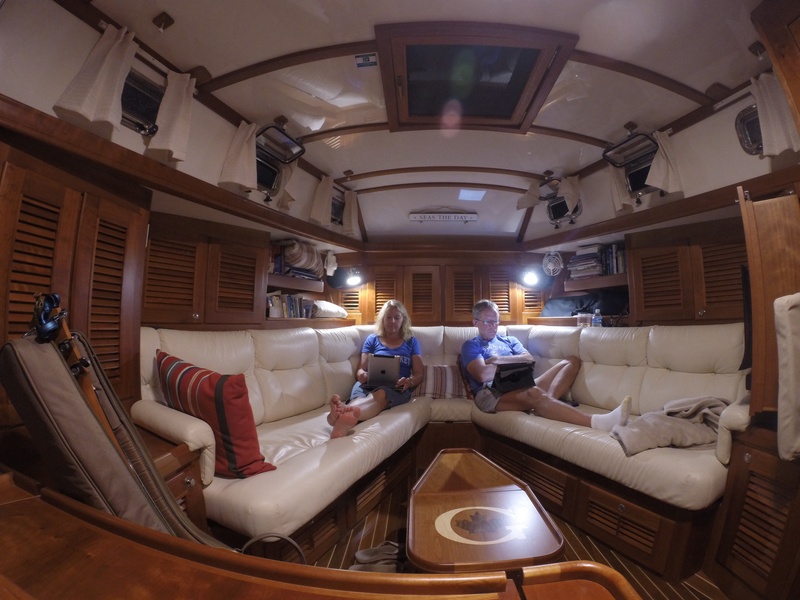 Our ultimate goal was to get to Newport, but that would be a 60+ mile day. What’s the hurry? We need to enjoy our time in these parts. 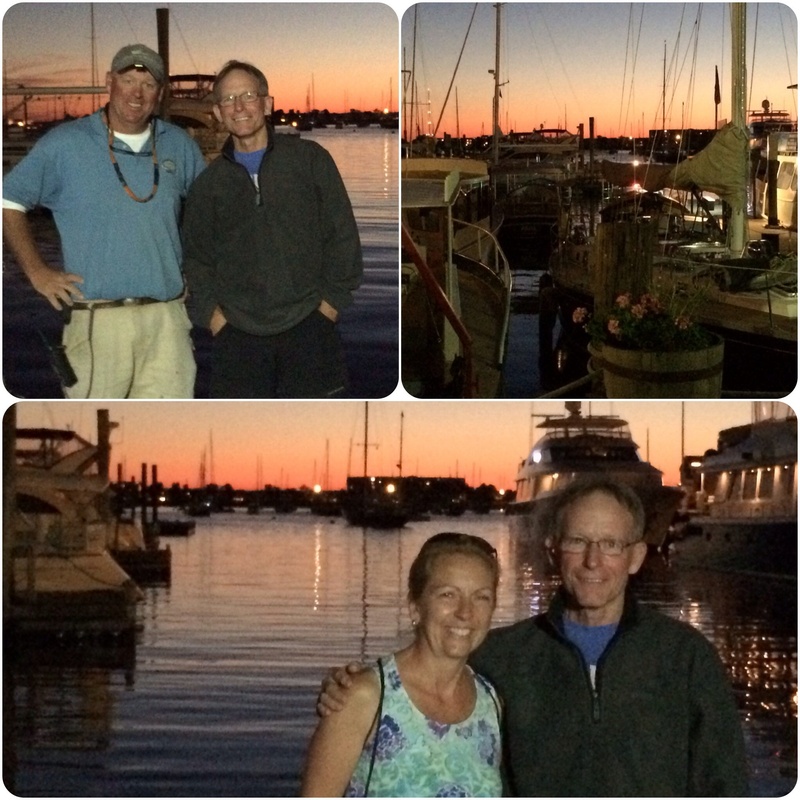 We chose to do a 30 mile hop over to Martha’s Vineyard which meant we didn’t have to leave at the crack of dawn. Good thing, because at the crack of dawn it was foggy again, but the forecast promised that it would burn off quickly. Happily, it did (we thought) and we set off. 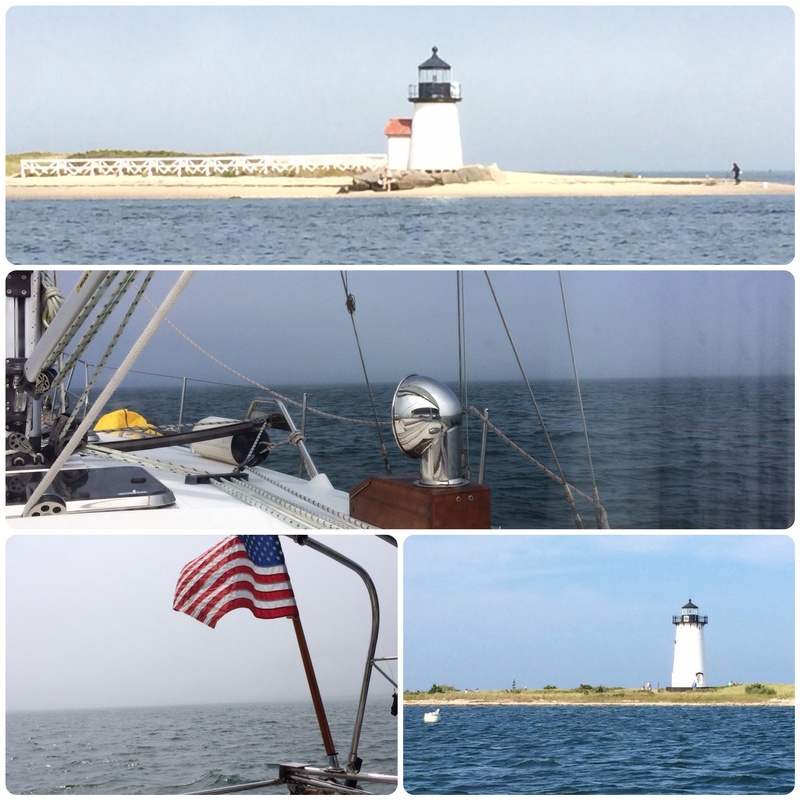 The series of pictures below shows the progression of the trip: clear passing the light at the exit of Nantucket Harbor, then some fog, then pretty limited visibility for quite a while! We have radar and that’s exactly what it’s for. We saw lots of fog last summer in Maine and, compared to that, this was child’s play. We’ve been unbelievably blessed with great weather for just about this whole month. The last picture is the bright sun shining on the lighthouse at the entrance to Edgartown Harbor on Martha’s Vineyard. We figured we’d stay for a couple of days before marching on to Newport. 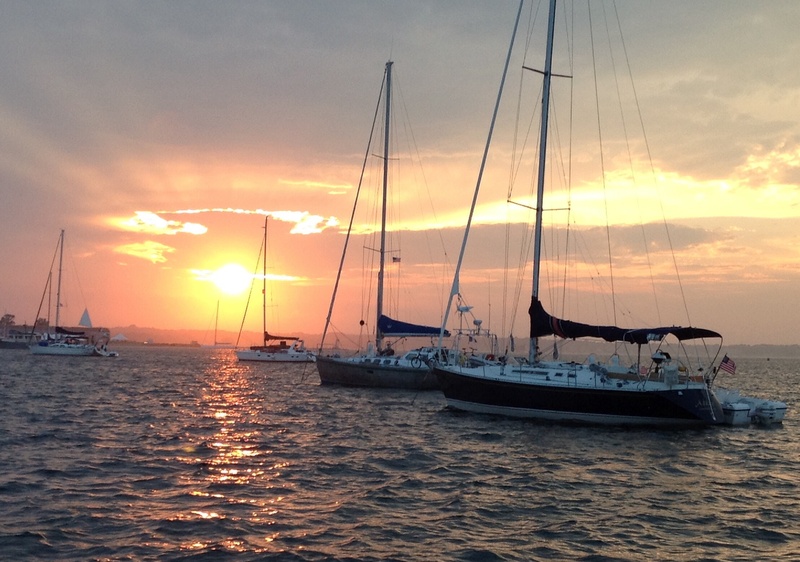 A clear trip – no a foggy trip – no, a clear trip from Nantucket to Martha’s Vineyard. Not much to say about our stay there. We arrived in the early afternoon, anchored, hopped off the boat and went into town. When we were in Edgartown last summer it was July, hot and crowded. We were looking forward to giving it another chance post-Labor Day. And this was the Tuesday after Labor Day. The weather was pleasant, the crowds were gone . . . this looked promising. And then we discovered that everybody who works on the island was burnt out. Okay, we’re familiar with seasonal business and end of season burn out from the years in Atlantic City, but even if you FEEL that way, a professional tries not to show it. Yeah, right. Servers and bartenders everywhere had no desire left to be kind to tourists. They were just done . . . and so were we. So instead of sticking around for another day of indifference, we decided to move on up the sound to wonderful Newport. Boaters’ paradise. Nautical Mecca. But first we had to get there. 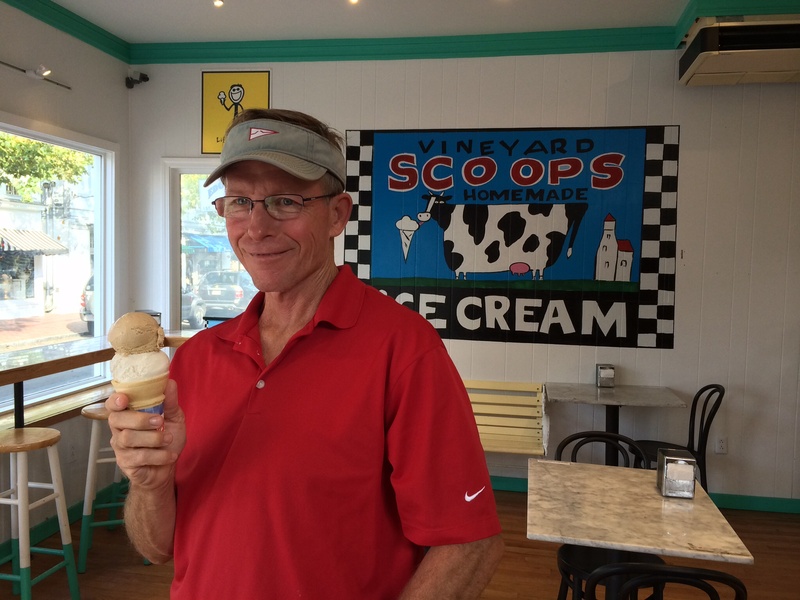 Ah yes – a redeeming feature in Edgartown. So it should have been a sweet ride up the sound. The forecast was for quite a bit of wind, and that there was, and not downwind. What does all of that mean? We got slapped around a bit that day! If you’re not familiar with the term “fetch” (not as in what you say to Fido) it means, “a) an area where ocean waves are being generated by the wind; b) the length of such an area. There was a fair sized fetch meaning fair sized seas. Interesting that fetch rhymes with “retch.” Happily, we did not, but it crossed my mind once or twice. We could have bailed and stopped at a closer location, but we really wanted to end up in Newport and so resisted the urge. 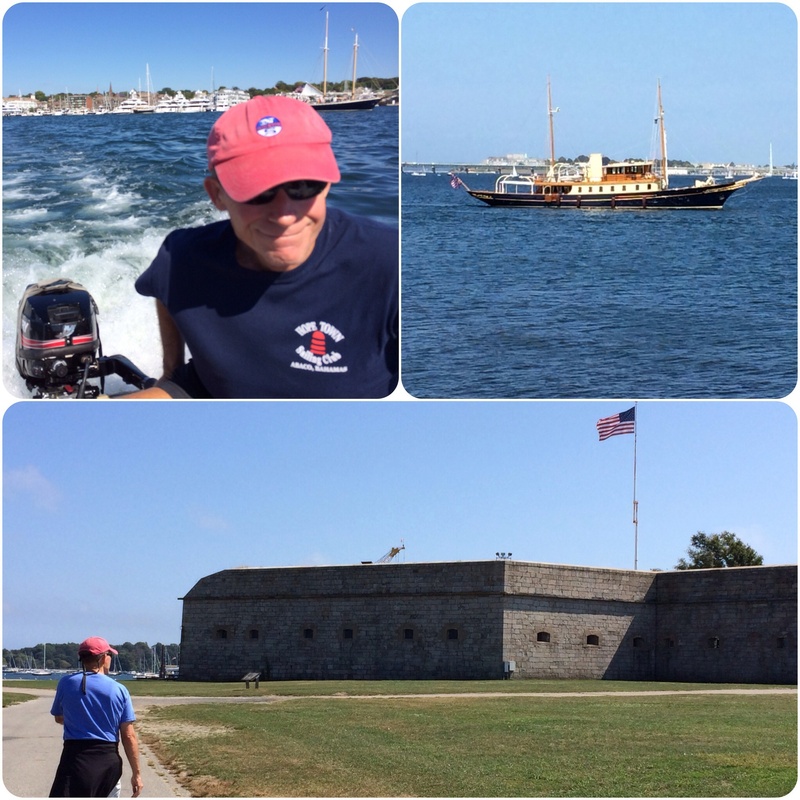 About six grueling hours later, we were in Newport. In my head I rate the comfort level of days as to “how would family members like being on the boat today?” As I told one of my sisters, NO ONE would have liked being on the boat that day. But . . . we were there, safe and exhausted. I’ll have my house on the rocks, please. 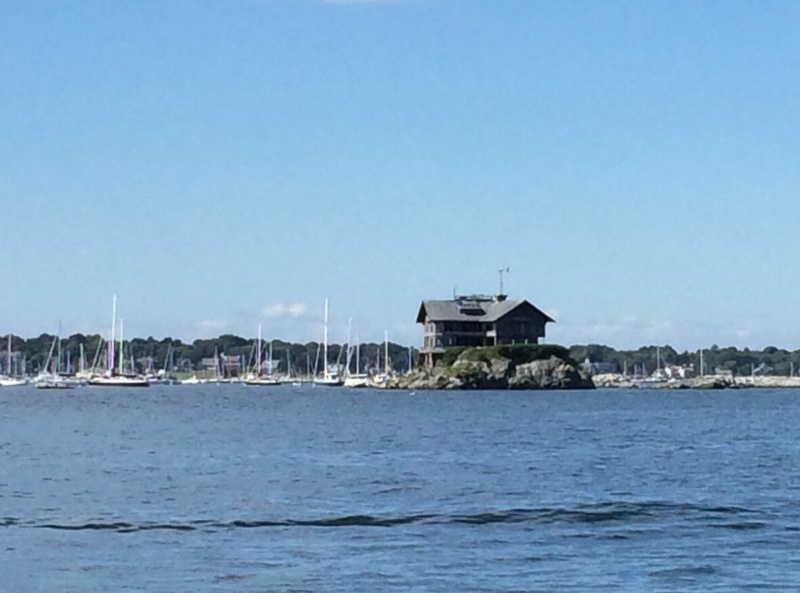 Last year we were in Newport over Labor Day Weekend and in not such great weather – and still loved the place. We also got wise to the good anchorage there. Now we were going to see Newport in all its glory. Newport is a good sized town and there are blocks and blocks of eclectic shops, restaurants and pubs. There are museums and historic mansions. There’s tons to see and do. Go there if you ever have a chance. 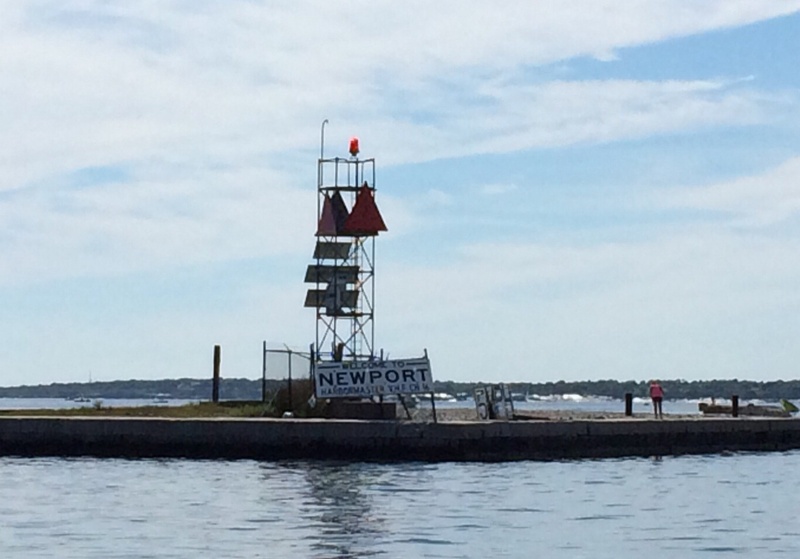 Newport – in all its nautical glory. First evening in Newport. Frank making friends with the launch driver. Day 1 – Walked and walked and walked. Frank had a mission: we had determined an appropriate belated birthday present for me: a GoPro camera. Online, he had scoped out local retailers and we were going shopping. Long story short, after many miles and three stores, we finally got the camera and necessary accessories. A new toy! Scouted out the Midtown Oyster Bar for lunch and met Timmy, our MVP bartender for this trip. It would not be our last visit to Timmy. 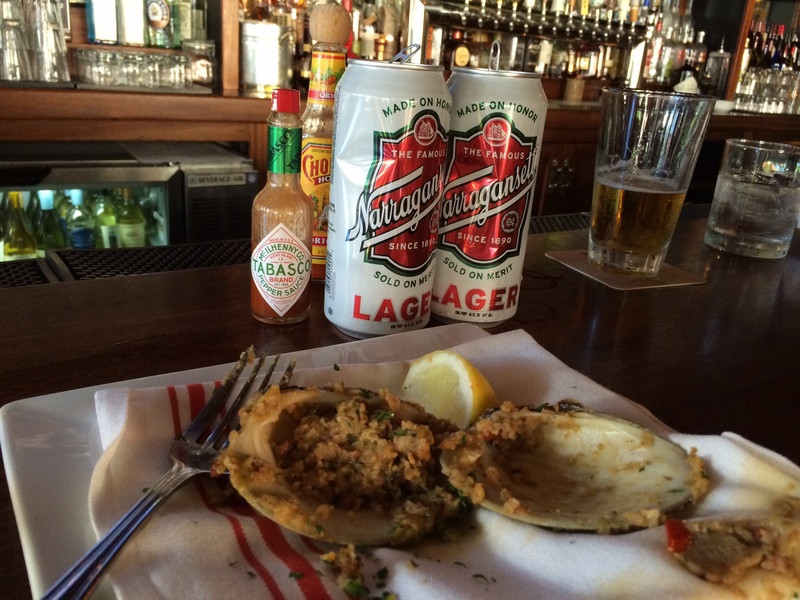 Midtown Oyster Bar – our hangout. Back at the ranch later . . . What a typical night looks like on the Eleanor Q. Close up view thanks to the GoPro. I’m controlling the camera from the iPad! Day 2 – Laundry Day and “time alone” day. Yes, we all need to have a little time alone, so Newport provides the perfect opportunity for us to go our separate ways for a while. I was stationed in the Boater’s Lounge laundry (GREAT facility for cruisers) with the plan to go actually walk IN some shops while the clothes were spinning around. Frank’s plan was to rent a scooter and see some other parts of town. Earlier he had asked me if I wanted to tour with him on the scooter. I pretty quickly answered a resounding no! I confess, I’m not a fan of open road two-wheel transportation. I did ride on a motorcycle with him a couple of times and lived to tell about it, but I was pretty much praying to come back in one piece the whole time I was riding. Yeah, I’m a chicken. Cut me some slack, I’m living on a boat, okay? 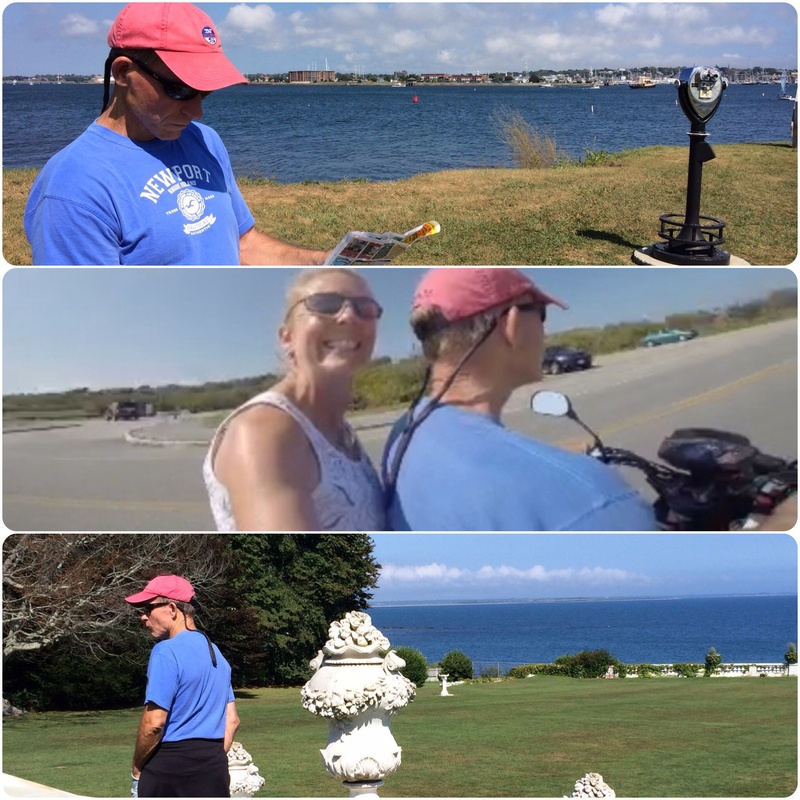 So back to Newport – an hour after we’ve split up, Frank calls me and says, “I’m riding this scooter around and this is a GREAT way to see the place – it’s beautiful! Do you want me to come back and get you? You really gotta see this.” How nice was that? So I grabbed the last articles out of the dryers, we threw the finished laundry in the dinghy and off we went. I got over my nervousness pretty quickly and he was right . . . it was spectacular. And I managed to talk Frank into stopping for a tour of one of the mansions. A mansion tour is “something you should do” while you’re in Newport – at least that’s what people have told us. Ours was a self-guided tour that should take about an hour. Yup – we did it in 28 minutes. Dinghy ride into town and some sightseeing. Our Scooter tour around town. 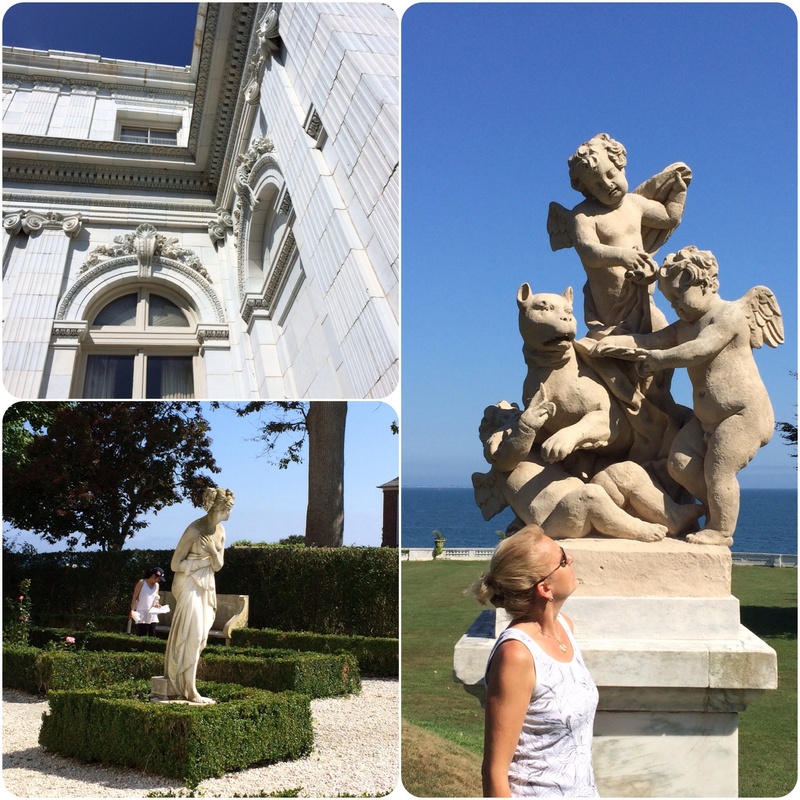 The Mansion Tour: The grounds of Rosecliff. I have NO idea what that sculpture is. It so happened that the scooter rental place was right beside the Oyster Bar, so of course we had to stop and visit with Timmy. It would be rude not to. Day 3: Woke up to a foggy day in Newport. We weren’t going anywhere so we didn’t care, but there were a number of regattas planned for the day. It cleared up enough to watch some stunning boats go by on their way to compete. We went in to town and THIS time, we went our separate ways for a while. I did girl things like go in shops and look at clothes and flip flops and then went to the International Yacht Restoration School. 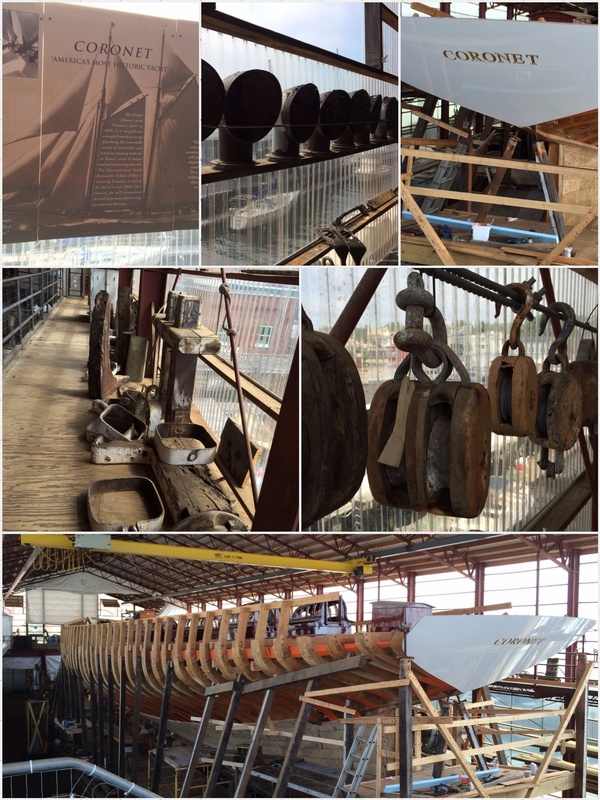 We visited there last year and I wanted to see what progress they had made on restoring the 151 foot “Coronet” – the oldest wooden yacht still even a little bit in existence. It is being rebuilt/restored at the school – a project that will go on for years and years. Work on the Coronet is slow and deliberate. Everything that was found on the yacht has been carefully saved and tagged to put back in the vessel later. 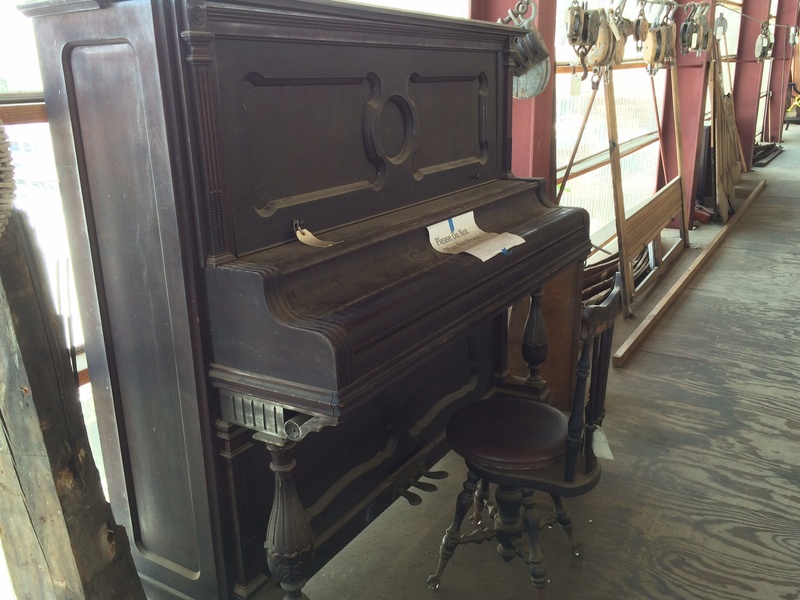 It even had a piano on it!! That would be interesting to play when you’re heeling. Frank went to boat yards. A couple of hours later, we met back up at – uhm, er – the Oyster Bar to hang out with Timmy on our last day in town. Yes, we’re in a rut considering how many cool places there are in Newport to explore. But the Oyster Bar was just that good. Newport is way up on our list of favorite stops. Great town! And if you go there, please say hello to Timmy. I know, right? Lucky for me (I think) ice cream doesn’t care for me much, so I just settle for a bite of his. However, there is no such thing as a safe bag of potato chips on board!! Greetings Frank and Mary Marie! What a fantastic chronicle of your many seafaring adventures! John has just now shared your postings with me probably because you are now in Newport where I was last weekend with my cousin, and where John and I are headed in October when we visit Christian at Johnson & Wales in Providence. I have somehow managed to convince the adventurous (not) Mr. Finamore that we should tour the mansions while we are in RI and he has agreed! I am sure that our impressions of Newport from a landlubbers POV will differ from yours, but we look forward to it nonetheless! Enjoy the GoPro and keep those wonderful photos and blog entires coming! Oh, and belated congratulations on Nicole’s proud showing on the Food Network’s Star competition! John and I watched religiously for the duration of the show! Very exciting! We will pass on your comments to Nicole. It made for an exciting summer! Frank always has very nice things to say about Christian and fond remembrances. Enjoy the October trip to Newport and stop in the Middletown Oyster Bar and say hi to Timmy!! He’s a big, Irish guy around 50. Great place.